Description: Alumaloy is a aluminum repair rod that is used to fix items such as boats, tools and fences without welding. The website provides detailed instructions on how to repair aluminum as well as user feedback with photos and video. Owned by Bradshaw Consulting, Inc. I oversee the companies shipping division as well as retail outlets that handle this and other product lines. The website was re-branded with a new logo in late 2010 as well as some new features. This is the first in a series of three metal alloys used in repairing aluminum, cast iron and steel. 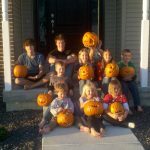 This year after the pirate birthday party for Jessikah and Derrick all the kids carved pumpkins which is a yearly tradition in Carmen’s family. Here you will find items such as my resume, social network links and companies I am associated with or working for. I’m founder and CEO of Bradshaw Consulting, Inc. which is an IT management and consulting firm. Over the years this company has grown into not only a computer consulting firm but a business consultant in general. My direction with that company and personally has led me to work with other companies helping them grow and increase profitability. Over the years Bradshaw Consulting, Inc. and myself personally has started and partnered a wide variety of businesses. Feel free to visit the projects section to see more about these and other companies I’m associated with. I’m in the process of re-branding most of the websites I’m associated with and I will add them to this section as they are completed. Please check back often for updated information, and if there is something you’d like to see that isn’t here, don’t hesitate to contact me! Here use to be a forum and one of the users to that forum posted the best blond joke ever. Since then the forum has been removed and I noticed traffic to my domain name looking for the best blond joke ever so I re-added it to my site. Honestly, I wish the forum was still here.